New York Police have a male suspect in custody after an explosion Monday morning in the subways below the Port Authority bus terminal in midtown Manhattan, leaving four injured. Police arrested Ullah Akayed, 27, a Brooklyn resident who came to the U.S. seven years ago from Bangladesh, an NYPD spokesperson told Jalopnik. It appears as if some sort of homemade pipe bomb strapped to the suspect’s chest was used, the spokesperson said, however the type of explosive has not yet been confirmed. The explosion happened around 7:30 a.m. Monday and has since brought New York’s subway systems to a halt in Midtown Manhattan. The explosion is being attributed to a homemade pipe bomb the suspect had strapped to his chest and failed to fully detonate. 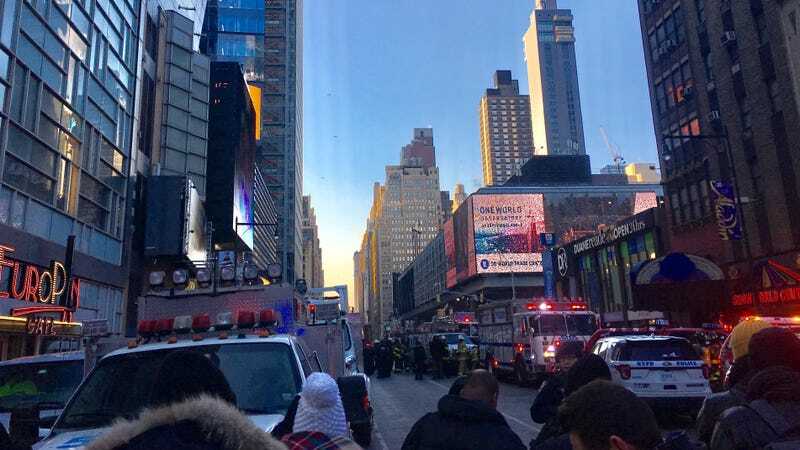 Pierre Canning, a tourist visiting from Ireland, heard an explosion Monday morning from the 26th floor room at a hotel at 42nd & 7th in Times Square. Canning told Jalopnik it caught him by surprise. “I didn’t know what it was,” he said of the scene a block away. “I just heard a bang.” Canning’s heading home later today. The New York City Fire Department reported four non-life threatening injuries at the scene. One of the injured individuals is reported to be the suspect detained by NYPD. Police are advising New Yorkers to avoid the area. Police have formed a firing line along 8th Avenue, from 40th to Columbus Circle. While police form up and helicopters buzz overhead, unflappable New Yorkers continue to go about their day. The Port Authority bus station has already reopened. Subway stops near Port. Authority remain closed.